Sent you a PM Neal. I see $16 4pcs to Spain, how much for 2pcs? Sweden Post shipping, isn't it? I’ll be interested in a few. How are the aspire cells in terms of performance? Can it compete with the best of them? The aspire are the best 18350 available at the moment. The Maximum Continuous Discharging Current is listed as 8A, which probably wouldn’t be optimum for “pocket rockets” like the Emisar D4s, particularly running Nichias. The extra capacity and protection might appeal to users of more moderately powered compact lights though. Nice guy with an email. I don’t see a known company. Is it possible this deal is not what it seems? Neal has a long relationship with BLF. I believe he used work for Banggood, right now he is involved in the BLF GT super thrower project. I would trust him with my money any day. Hi Neal. Are you shipping to Australia? it seems not bad for the mail. Thanks Neal, shipping was super fast and they were well packed. I have run the normal discharge test of the Lii-500 with 500mA as charging current (discharge current is 250mA in that case I think) 5 times for each battery. For each cycle I moved the battery to the next slot. I was curious about the accuracy of the different slots. Battery 3: 1155mAh gained 61mAh – first measurement was 1108mAh last 1169mAh – I wonder if the capacity would increase even further but it just takes to much time to play around more. Neal is 100% reliable for me. Yep, Neal worked for Banggood for a number of years, and has been active on BLF for several years. He knows his flashlights well, and he is a trustworthy guy. Thanks Neal. Your Google doc opens for me now and Aus is on it. Wouldn’t open the other day. Cheers. PayPal and PM sent. Thanks Neal. 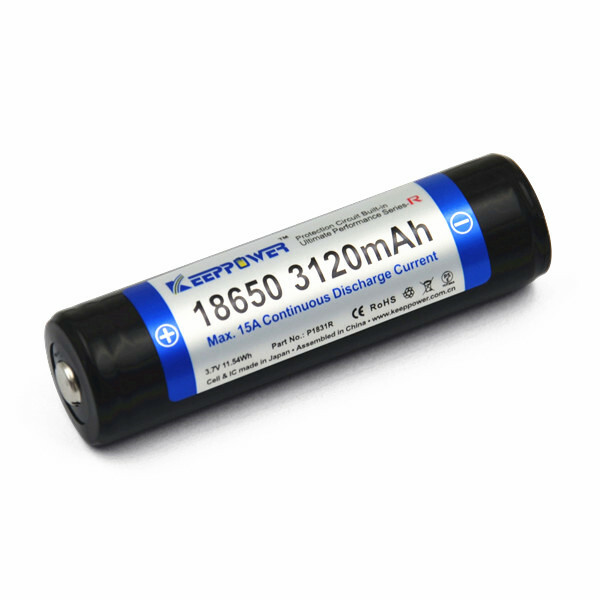 Keeppower 18350 1200mah are these aspire re-wraps with protection? Can you get unprotected ones and how much for 4 keeppower to Belgium. I need 8pcs of Aspire 18350, please PM me your Paypal account. Just open the google-doc file. All you need is inside that. L4M4: I believe that is for the aspire cells and not the keeppower. At least there is no mentioning about the keeppower cells… From reading the aspire test thread I also believe the keeppower is a bit cheaper. Choose Send money, then Enter amount, then in the “Review and Send” step I can choose either “Sending to friends and family” or “Paying for goods or services”.